Many commercial buildings in Houston have large water storage tanks to meet city plumbing code requirements. These break tanks provide water for fire protection pumps and domestic (potable) water pumps to supply the building. A major concern with break tanks in the building is the potential for flooding due to tank overflow. This is especially critical when the tanks are in a basement level. In order to maintain a constant water level in the break tank, float style or electronic fill valves and controls must be used. The valves open when the tank level is low, and when the tank level returns to normal they close. With either system, there is a potential for the fill valve to fail in the open position, allowing water into the tank without control. The Houston Amendments to the Uniform Plumbing Code has specific guidelines for tank overflow and vent sizing, so in the event of a valve failure, the excess water will flow through the overflow to a floor drain. Especially on a fire tank system with large fill valves, this can be up to 1,000 gallons per minute of water pouring onto the floor of the pump room. Even when properly sized, floor drains may not handle this sudden demand (trash, etc. ), and water can flood the pump room. To avoid this situation all together, Cougar USA recommends shutting off the tank water supply when a critical high level is reached. This requires a control panel, tank-level sensors and an additional valve in the tank supply piping — often called a block valve. The block valve is normally open and only closes in the event of a tank high level. The Cougar Systems Elite Control Panel and Tank Sensors monitor the tank levels using a pressure sensor and conductivity probes. The High Level Alarm Settings are made on the touchscreen to control at what tank level the block valve will be closed. There are two styles of valves that can be used for the block valve. The same electronic Cla-Val used for the fill valves can be configured as a block valve. This can be an effective block valve but it must be exercised regularly with water flow through scheduled preventative maintenance (PM) to ensure proper operation of the valve. Without regular PM, there is a high probability the valve will not close in the event of a tank high level due to air on the diaphragm or trash in the tubing or solenoid valve. 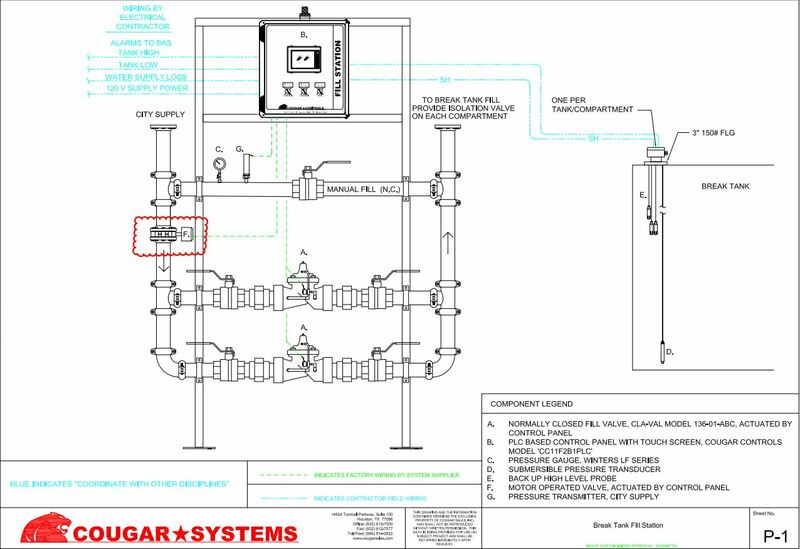 Cougar USA recommends the use of a motor-operated butterfly valve for a block valve. The butterfly valve's ability to perform is substantially less affected by intermittent use because it uses an electric motor to actuate the valve rather than a hydraulic actuator. It can also easily be tested without requiring water flow, and it requires less piping space than a same-sized Cla-Val. Tank overflow and flooding can be mitigated with a block valve and controls but, with any tank system, the Building Management System should always monitor tank levels and alarms. For more information or a free building assessment from Cougar USA, contact us here.